The resurrected one. The light that fears no darkness. Asgodian warrior without peer. Known as Orion before his rebirth, he is the adopted son of All-Highfather Odin, half-brother to L'ok D'saad. He is Thorion! 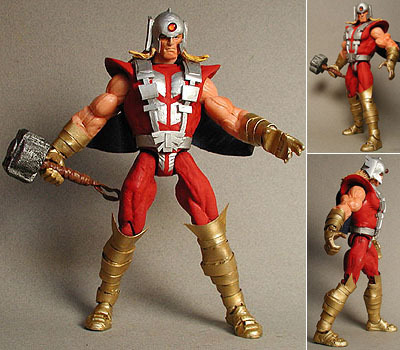 This product of the Marvel/DC Amalgam crossovers used to be a Marvel Legends Thor. The first thing to do when you get a figure this big is take off the excess details and start filling in other areas with resin. I cut the head wings off as well as the knee pads (wish now that I would have kept them on) and Dremelled off any excess. Next, I applied a healthy amount of Magic Sculpt resin and begin cutting the vinyl for the arm and leg wraps. This involves a lot of flexible vinyl and a sharp X-Acto. I also have a bag of spare vinyl pieces and I used some of the thicker stuff for the shoulder/chest harness, the belt buckle and the head wings. The kneepads are again cut vinyl and are glued so that the knee can still bend and retains its original articulation. The straps are glued to the figure and then I use resin to close the seam and smooth over any rough spots. Remember, always put your seams at the back of the figure. The extended shoulders are built up with resin and smoothed with sandpaper. Once the resin and vinyl pieces have been glued on, I started painting the figure with thin coats, letting it dry in between each application. The bands were painted metallic gold, the chest is flat red with silver painted on top. I use Tamiya and Model Acrylic paints. When I use metallic, I tend to not seal the figure with Dullcote for the obvious reasons. The hammer was modified by cutting a Dremel sanding wheel in half, gluing it to each side of the hammer and then using resin to smooth it out. It's painted silver with a flat black wash for age. The helmet jewel is a red glass bead and the cape is cut fabric from a Mattel Batman cape.